Box Text: TIME TO STRIKE! 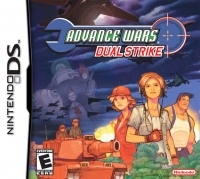 Advance Wars: Dual Strike, the latest game in the award-winning turn-based strategy series, unleashes the power of the Nintendo DS! Direct the new Commanding Officers and familiar faces into battle against the nefarious Black Hole Army. *Dual-screen battles rage on two fronts while your troops rally behind two Cos at the same time! *With Touch Screen control and wireless multiplayer gameplay, war has never been more fun! *Command powerful new COs and units, including shadowy stealth fighters and hulking megatanks. 05-24-2016 Box Text TIME TO STRIKE! 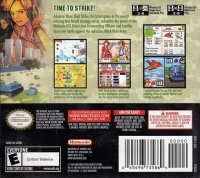 Advance Wars: Dual Strike, the latest game in the award-winning turn-based strategy series, unleashes the power of the Nintendo DS! Direct the new Commanding Officers and familiar faces into battle against the nefarious Black Hole Army. *Dual-screen battles rage on two fronts while your troops rally behind two Cos at the same time! *With Touch Screen control and wireless multiplayer gameplay, war has never been more fun! *Command powerful new COs and units, including shadowy stealth fighters and hulking megatanks. 02-04-2012 scott Box Text TIME TO STRIKE! 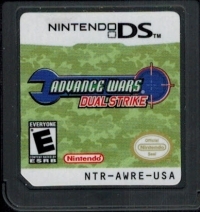 Advance Wars: Dual Strike, the latest game in the award-winning turn-based strategy series, unleashes the power of the Nintendo DS! Direct the new Commanding OFficers and familiar faces into battle against the nefarious Black Hole Army. Dual-screen battles rage on two fronts while your troops rally behind two Cos at the same time! With Touch Screen control and wireless multiplayer gameplay, war has never been more fun! Command powerful new COs and units, including shadowy stealth fighters and hulking megatanks. This is a list of VGCollect users who have Advance Wars: Dual Strike in their Collection. This is a list of VGCollect users who have Advance Wars: Dual Strike in their Sell List. This is a list of VGCollect users who have Advance Wars: Dual Strike in their Wish List.